Under heightened police powers, suspects can now be held without charge for one month, up from four days. Pro-government supporters chant slogans and wave flags as they protest on Istanbul's iconic Bosporus Bridge on Thursday. TURKEY IS PUSHING ahead with a sweeping crackdown against suspects accused of taking part in the failed coup against President Recep Tayyip Erdogan. The country has extended police powers to hold people in detention, and shuttered over 1,000 private schools. A week after renegade soldiers tried to oust him with guns, tanks and F16s, Erdogan’s government has rounded up or sacked tens of thousands of perceived state enemies, including almost 300 officers of the guard shielding his Ankara palace. But in its first major release of suspects amid global criticism of the crackdown, Turkey set free 1,200 low ranking soldiers in Ankara. Under heightened police powers, suspects can now be held without charge for one month, up from four days, the official gazette announced on the third day of what Erdogan has said would be a three-month state of emergency. Fears that Erdogan will seek to further cement his rule and muzzle dissent through repression have strained ties with Western Nato allies and cast a darkening shadow over Turkey’s long-standing bid to join the European Union. After Brussels issued stinging criticism and warned Erdogan that bringing back the death penalty would end the membership bid for good, Erdogan fired back that the EU had taken a “biased and prejudiced” stance on Turkey. He added bitterly that “for the past 53 years Europe has been making us wait” and that no EU candidate country “has had to suffer like we have had to suffer”. Strains have also grown with the United States, which relies on Turkish bases to launch airstrikes against the Islamic State group in Syria and Iraq. The man Erdogan accuses of orchestrating the plot against him, the reclusive 75-year-old Muslim cleric Fethullah Gulen, has long lived in a secluded compound in Pennsylvania, and Ankara is pushing for his extradition. President Barack Obama said yesterday the US would take seriously any “evidence” of wrongdoing by the preacher, whose followers, including alumni of his foundation’s schools, have long had a strong presence in Turkey’s police and civil service. Obama also flatly rejected claims that the US had prior intelligence of the 15 July coup attempt, calling such suggestions “unequivocally false”. Erdogan has insisted that, despite the new emergency powers and the mass purges, Turkey will not “compromise on democracy”, as Ankara has said its measures are no different to those France has taken since a series of bloody jihadist attacks. 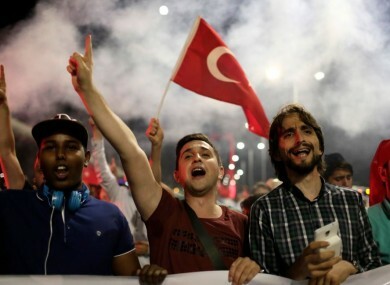 Prosecutors said Turkey had set free 1,200 soldiers, all privates, detained in Ankara after the military coup, as authorities were seeking to swiftly sort out those who had fired on the people from those who did not. To root out what Erdogan labels the “virus” of Gulen’s clandestine “terrorists” and their sympathisers, his government has sacked thousands of state teachers and university lecturers, who have also been barred from overseas travel. In the latest move targeting the education sector, 1,043 private schools and 1,229 associations and foundations will be shut down, today’s Gazette statement said. The steps were just some of the seismic changes that have rocked Turkey since the shock of the coup attempt that claimed 246 lives. The night of violence left 24 rebel soldiers dead and killed 179 civilians, 62 police and five soldiers who opposed them and have been hailed as “martyrs”. Since the coup, massive crowds of flag-waving Erdogan supporters have taken to the streets night after night to celebrate their leader. But rights activists and opposition groups, including from Turkey’s Kurdish minority, fear a widening witch hunt of government critics. According to the authorities, 10,410 people have been detained — mainly soldiers, including 283 Presidential Guard officers, but also police, judges and civil servants. Of these, 4,500 have been formally placed under arrest. The Turkish government has also cancelled over 10,000 passports, mainly of state officials, “due to flight risk with the holders either in custody or on the run”. Aside from the detentions, more than 50,000 other civil servants, down to the family and sports ministries, have been sacked or suspended — in a purge whose speed and scale suggested to many observers that their names were on pre-existing lists. The government also plans more far-reaching institutional changes, said the interior minister, Efkan Ala. Crucially, he said, control of the gendarmerie, in charge of domestic security, will be wrested from the army and placed under the interior ministry. Email “Turkey shuts over 1,000 schools and extends police powers after failed coup”. Feedback on “Turkey shuts over 1,000 schools and extends police powers after failed coup”.